Dan James and IRA Top Gunner in their freestyle at the Kentucky Reining Cup. 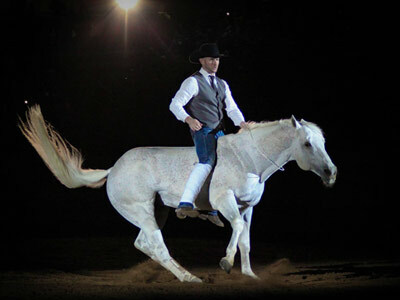 When the spotlight found Dan James beside his horse, IRA Top Gunner, during the recent Kentucky Reining Cup Freestyle World Championship, it appeared at first that the Australian horseman could hardly walk — and the crowd wondered in anticipation how James would possibly be able to ride. But step-by-step with his trusting steed, James leaned on his crutch as he approached the center of the ring – a very different image than what audiences saw last year as he galloped down the centerline dressed as Tonto to the tune of “The Lone Ranger,” and won the 2014 Kentucky Reining Cup Freestyle World Championship. Dan James puts Smart Little Elan into a spin during his winning ride at last year’s freestyle. After a young horse fell on James on March 6 and crushed his lower right leg, the professional reiner’s riding career could have easily been over. Luckily, fate had other plans. “God’s grace, wonderful surgeons, nurses, and amazing friends have helped lead to a speedy recovery,” James announced before the Kentucky Reining Cup at the Kentucky Horse Park in Lexington, Kentucky. “I had pretty much written off being able to compete. When I left the hospital I thought I would be lucky to walk again, let alone do anything with the horses in the next couple of months … about two weeks (before the event) I thought maybe I could take that stud horse out there, tip my hat and be grateful to be walking. Then I thought if I could do that much, maybe I could get on … That was my fourth ride back”. Inspired by those who have fallen and risen again, James found the courage and the strength to rise again himself. He was cheered on from the audience by fans and supporters, including representatives from Omega Alpha Pharmaceuticals, a producer of health supplements for humans, horses, and other animals and for whom James is an ambassador. As James asked his horse to lay down in order for him to be able to mount, it was clear he was riding for so much more than to defend his 2014 championship title. And as IRA Top Gunner (Playgun x Little Peppys Vet) loped off with James aboard, the audience cheered — amazed at the act of determination and faith. James’s incredible bridleless performance won him the People’s Choice Award — awarded to him for the second time in a row at the Kentucky Reining Cup Freestyle World Championship. Patti Hanco, Director of Business Development for the equine division of Omega Alpha, watched in awe as James beat the odds right before her eyes. Freestyle winner Laura Sumrall and Wimpy’s Top Model. Laura Sumrall, a 22-year old scholarship athlete and senior captain of the Women’s National Equestrian Team at Texas A & M University, clinched the 2015 World Championship Freestyle title with her Frozen inspired performance on Wimpys Top Model (Wimpys Little Step x Sailin Bueno). “This was the first time I had done this routine,” Sumrall said. “We came up with it pretty quickly after we got the invitation to compete at the Kentucky Reining Cup. Frozen came together pretty quickly. I’m at school at Texas A & M so I wasn’t in the same place as my horse, so practicing was a little challenging. I set out a pattern and ran it on a couple of different horses. It was really fun to put together … definitely a group effort my mom came up with the concept and did all the handiwork on my costume”. Pictured below is the winning freestyle by Laura Sumrall, performing to Let it Go from the movie Frozen, on Wimpy’s Top Model. Go James! Your amazing and an inspiration to me and many others. Have fun buddy, be careful, too.